Size: approx. 10 and 20 mm. Photo: 08/20/11, 10 am. 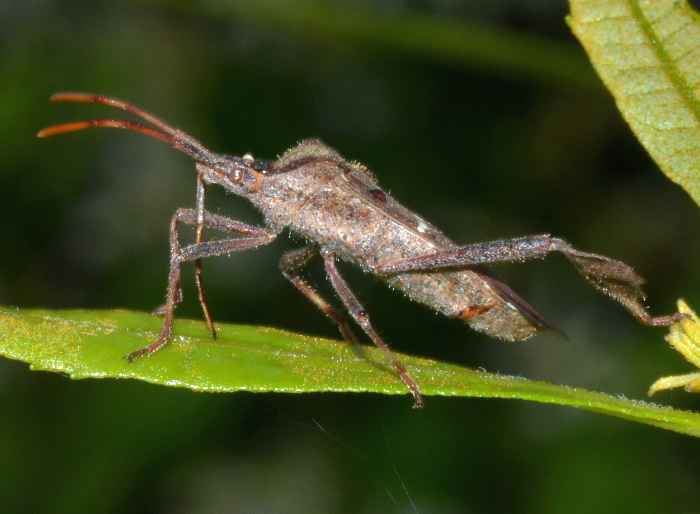 Nymphs of a Leaf-Footed Bug; most likely Leptoglossus fulvicornis. The species is highly specialized to magnolia trees and feeds on their (mature and developing) fruits. The big gray one is the fifth instar. The small photos show other stages. 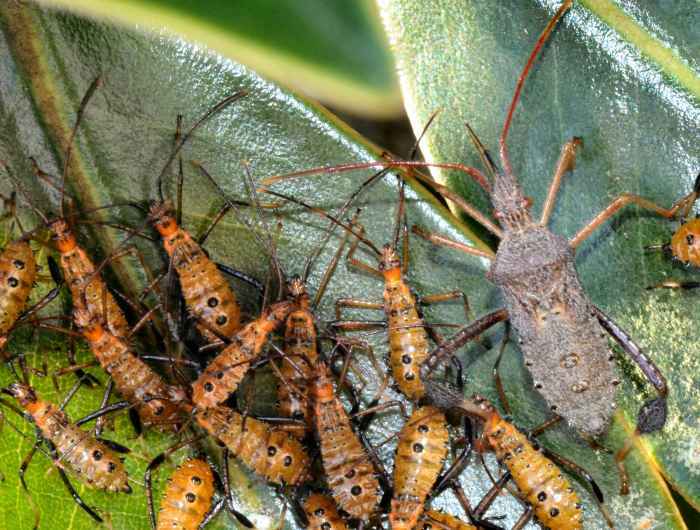 These bugs are highly gregarious and hang out in groups of 5-20. Size: approx. 20-25 mm. Photo: 08/25/11, 10 am. For one week I've been waiting to see an adult Leaf-Footed Bug (Leptoglossus fulvicornis) on this magnolia tree. Here it is. It differs from the similar species L. oppositus by the lack of three white spots across the back. 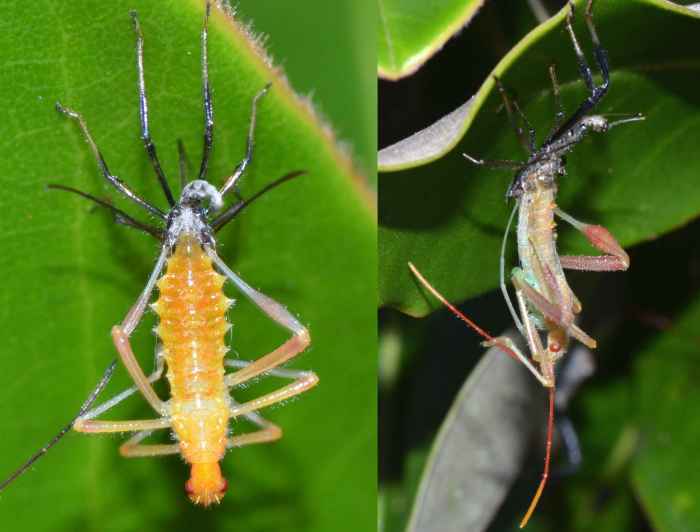 The small photo shows the same specimen and a fifth instar which is still rather pale and might have "emerged" very recently. Size: approx. 20-25 mm. Photo: 04/21/12, 3 pm. 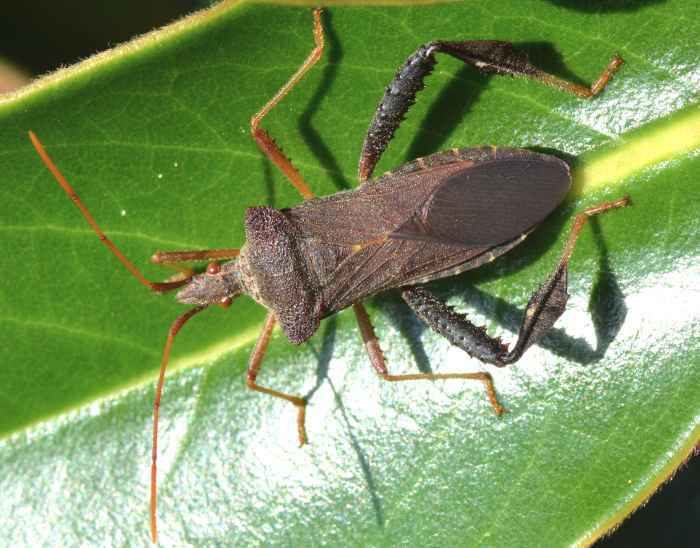 Leptoglossus phyllopus is a widespread species in the Southeastern US. Its distinguishing mark is the straight white to pale yellow bar on the back (corium). 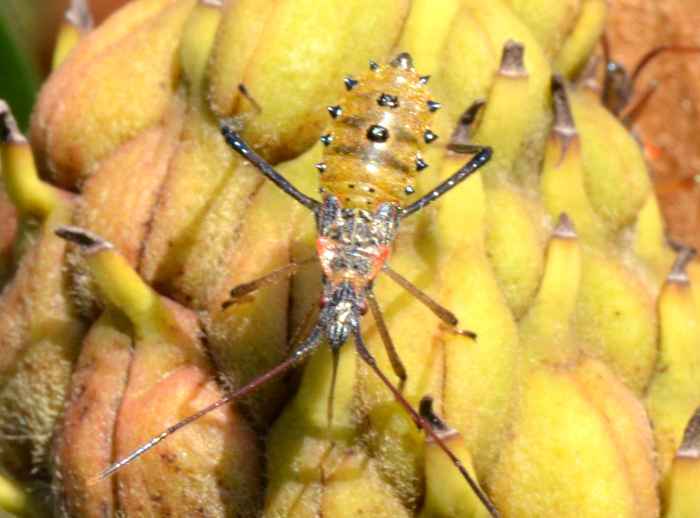 It is a minor pest in citrus groves. Florida is home to nine species of Leptoglossus. The UF document states that L. phyllopus is the only species in this family for which the common name Leaf-Footed is accepted. 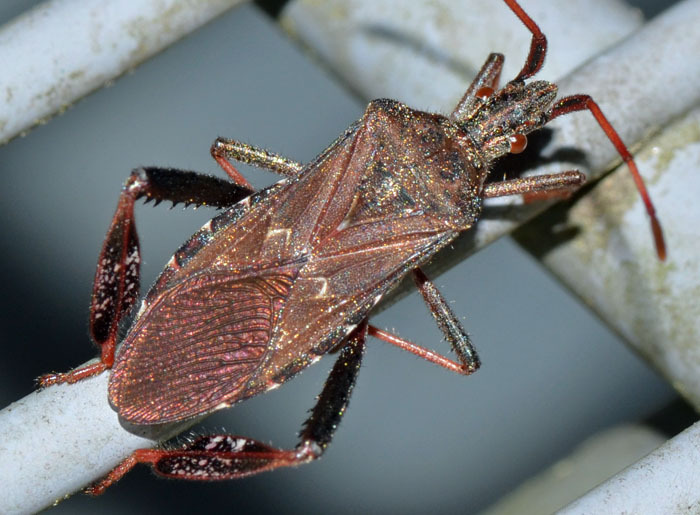 Leptoglossus corculus (Leaf-footed Pine Seed Bug). Size: approx. 15 mm. Photo: 08/06/14, 7 pm. 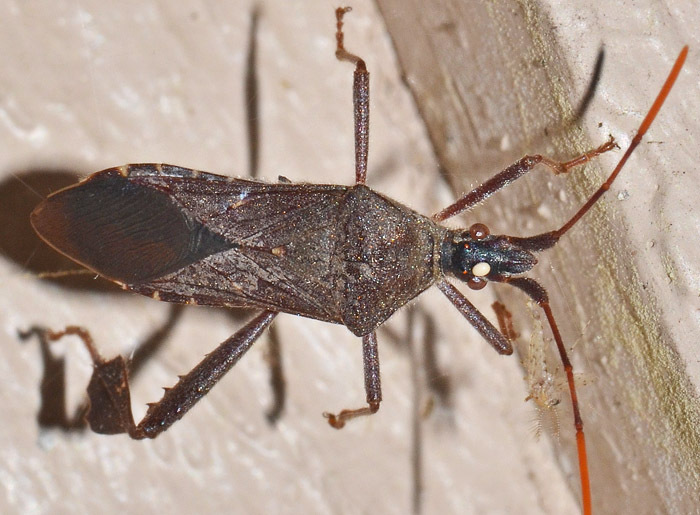 This bug is less common in Florida and closely associated with pine trees. Eggs are found in rows on pine needles. 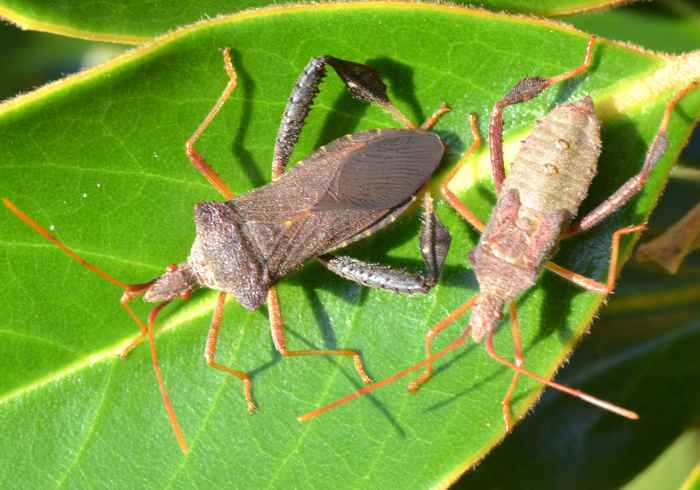 The second-stage nymphs feed on conelets, whereas older nymphs and adults feed the seed in cones. The second link notes that adults of this species can invade homes during the colder months (in NJ) but cause no damage to food, people, or the house structure. I found this specimen over the running (exterior) fan of our HVAC system. Size: approx. 16 mm. Photo: 06/07/15, 11 pm. 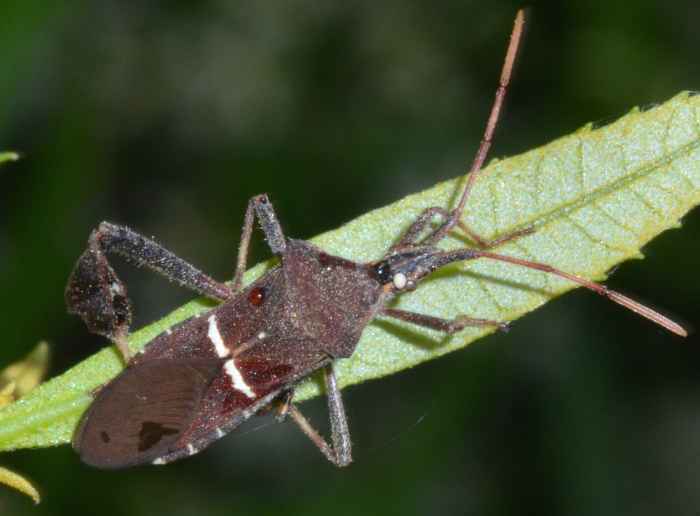 This nearly uniformly dark leaf-footed bug is Leptoglossus oppositus. Three or four of them were attracted to our porch lights. The species can be found from Texas to New York. The three white spots (as opposed to a horizontal line in other species) are distinctive. In this specimen the spots are slightly yellowish.